For this tour we will take you between the Val di Susa and Val Chisone valleys, on the back of one the highest white roads in Europe that connects Sestriere to Colle delle Finestre, theater of famous battles and stage of the cycling Giro D’Italia: the Assietta . It is a dirt road but doable for everyone, even with road tires and a passenger, but without forgetting that we will be at 2,400m of altitude, on unpaved roads, and therefore suitable tires, technical clothing and adequate speed are recommended. 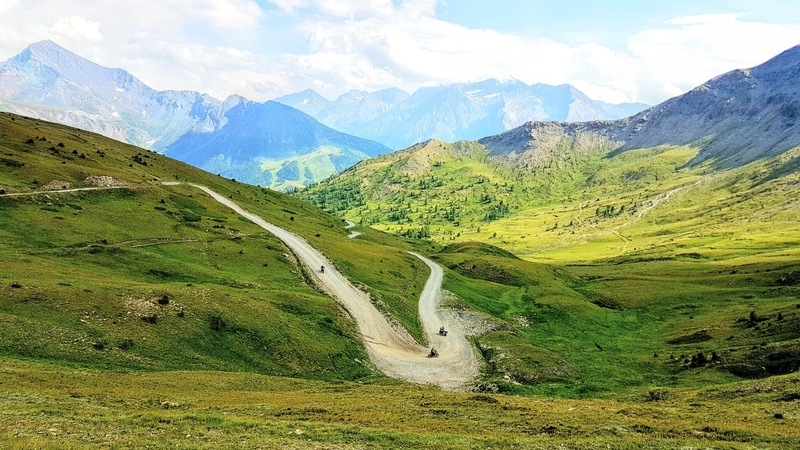 We start from Sestriere at 10, to start immediately to enjoy dust and stones: countless curves will soon take us to the top, where we will cross spectacular hills and enjoy enchanting views on the valleys below. During the day you will be given technical advice and notions about off roading, to learn how to manage your bike on gravel roads. We will do many relaxing breaks, a packed lunch in nature (included in the price), all the usual photos (Testa dell’Assietta, Colle delle Finestre, etc) and then we will stop for a snack in Usseaux before saying goodbye to Fenestrelle, with its fascinating and majestic fortress, one of the biggest in Europe.